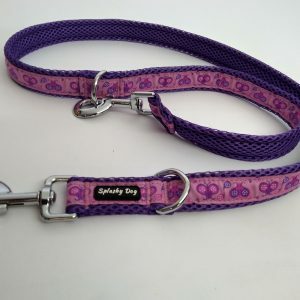 Splashy Dog air mesh dog collars are padded, breathable, lightweight, comfy, non-chafing and quick-drying, as well as great looking ! 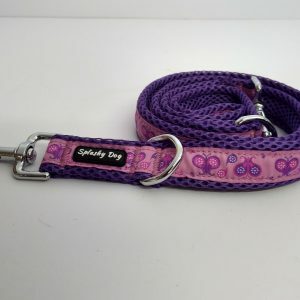 Splashy Dog Purple/Pink Butterflies design is definitely one for the girls, the ultimate pink dog collar ! 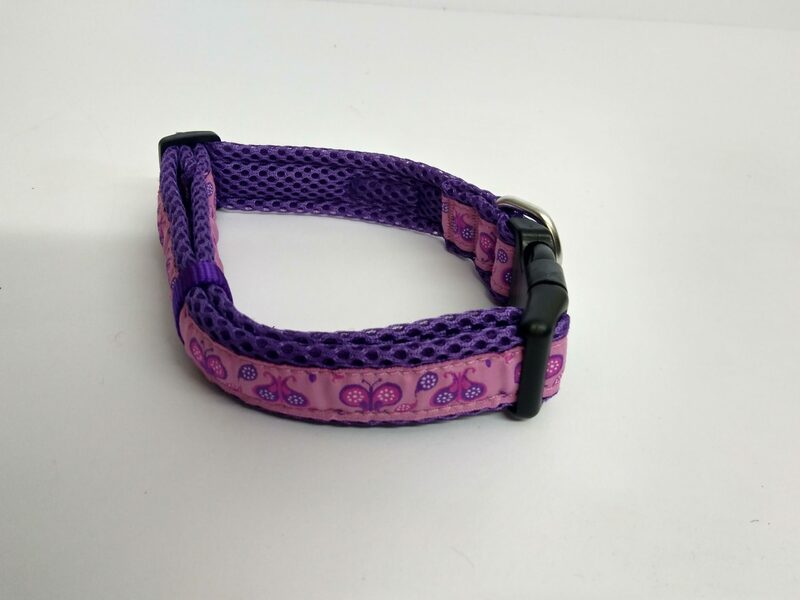 Purple and Cerise stylised butterflies are woven onto the ribbon which has a puppy pink background. 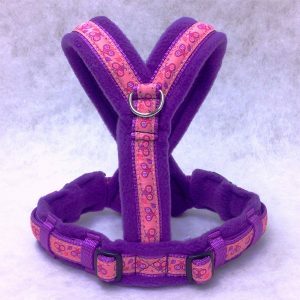 All colours are made to match our fleece and webbing colours on all our eDog harnesses for a perfectly co-ordinated look. 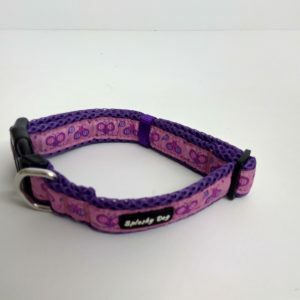 Splashy Dog collars are made from high quality air mesh tubes with a soft interior layer which acts as a wicking to wick away water, and moisture quickly. 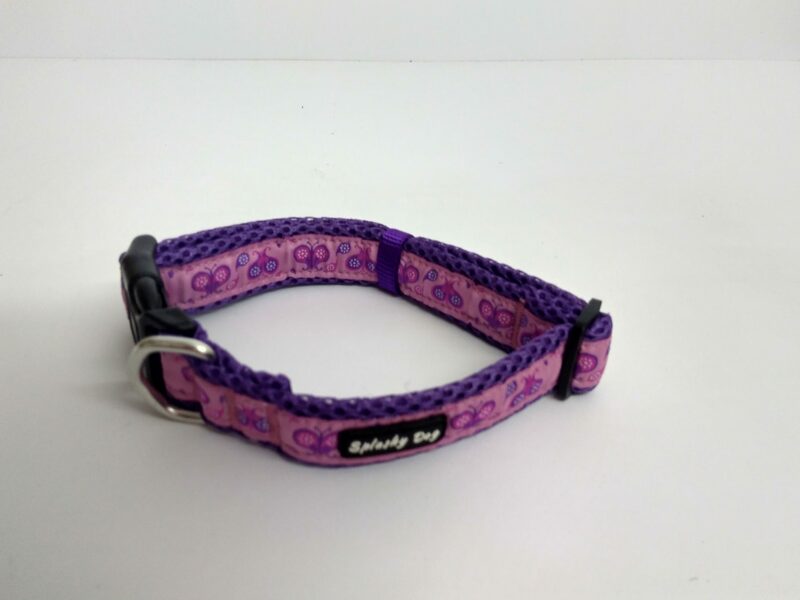 The air mesh is treated with a special anti-bacterial finish to prevent dirt and germs getting trapped next to your dog’s skin which can often cause irritation and chafing. This same air mesh is used in the manufacture of sports products such as our training shoes. 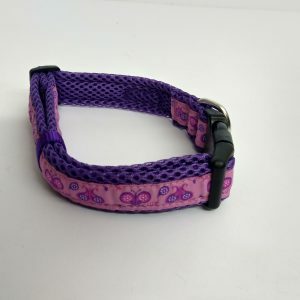 Over the air mesh is woven ribbon sewn on – used instead of printed ribbon whereby the design would rub off – this cannot happen with woven ribbon – so your dog collar will stay looking good for longer.